Opportunity Generator: "KNOW your own VALUE first"
This has been a big lesson in my life personally. I’ll share with you 2 examples of where this has played out in big ways. I now know that I am coming from a place of “lack” – not feeling worthy or valuable within myself. 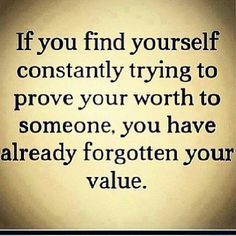 Simply, if I truly value myself I wouldn’t need to prove anything my state of being would just absolutely reflect the value with conviction and certainty. Example 1: During my teen’s & 20’s I experienced tremendous amounts of insecurity and self judgement. Nothing was good enough about me and I could only see what was wrong even if 99% was great, I’d always focus on the 1% that was wrong, defective, imperfect. This played out particularly with my physical body. I would do consistent & large amounts of exercise at the gym and always be striving for a perfect body. Although I experienced a fit, healthy, strong and beautiful body at the time all I could see were the imperfections. This is a classic case where I was trying to “feel better about myself” and no longer feel insecure by trying to fix, change and improve my external circumstances which ultimately never works medium/long term. The game I was playing was, if I have a desirable body and people are validating me for having a great body then i’ll feel worthy, valuable, worth it. Even though many people would complement me, the complements were never enough. It was like a drug that required higher and higher doses. and would on a deep level feel like I failed if they didn’t grow, expand and get the results we both wanted. Again, I was unconsciously wanting my external circumstances to prove to me that I am worthy and valuable, useful and okay. The coaching and transformational work that I do is all about your State of Being and learning how to master your vibrational states and be a conscious co-creator of your reality. It’s a fun game that not many people know how to play it effectively. To play this game you have to Know who you are at the soul level and remember your true nature. This is also super fun and a worthwhile adventure. Just imagine waking up each morning feeling excited about life, knowing that I am 100% supported always, knowing that I can attract to me whatever is required and that life always offers me incredible opportunities. This way of living has been so much more fun compared to running on the hamster wheel that never ends until I jumped off. Not sure what your next step is?